The Macomb Coounty Bar Foundation hosts the Macomb County Law Day ceremony held each spring in the Macomb County Board of Commissioner's Auditorium. This standing room only ceremony is the culmination of student's work, grades 1 through 8, that discuss, and create essays and posters on legal topics. (The teacher who submits the most “polished” posters will win the “Golden Apple award”. 1. This contest is open to students in grades 1, 2, 3 and 4. 3. Theme: "Separation of Power: Framework for Freedom"
4. The student may use any media (crayons, magic markers, chalk etc.) he or she wishes, but it must be on an “8½ x 11” sheet of paper. The teacher who submits the most “polished” essays will win the “Golden Apple Award”. 1. This contest is open to students in grades 5, 6, 7, and 8. 5. The essay must be printed or typed on an 8½” x 11” white sheet of paper. Grammar, spelling, and content will be taken into consideration. 6. IMPORTANT - On the back of each page, for the entry to be considered, we need the following information in order to notify the winners. Each Judge will score the posters and essays on a scale of 1 to 10 with 5 being average and 10 being the best. 1. Development of theme - "Separation of Power: Framework for Freedom"
1. 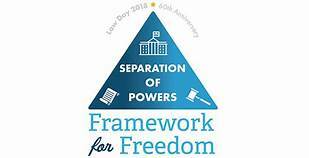 Development of Theme "Separation of Power: Framework for Freedom"